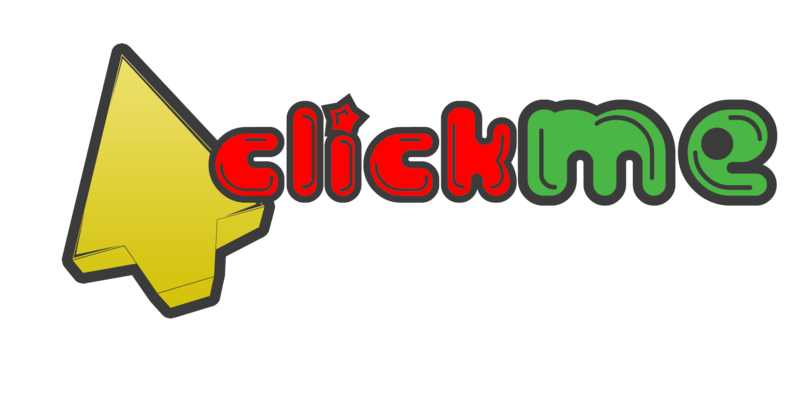 The trick with ratios is to always multiply or divide the numbers by the same value. Example: A Recipe for pancakes uses 3 cups of flour and 2 cups of milk. In other words, 12 cups of flour and 8 cups of milk. The ratio is still the same, so the pancakes should be just as yummy. The examples so far have been “part-to-part” (comparing one part to another part). But a ratio can also show a part compared to the whole lot. Proportion says that two ratios (or fractions) are equal. The ratios are the same, so they are in proportion. A ropes length and weight are in proportion. When shapes are “in proportion” their relative sizes are the same. Here we see that the ratios of head length to body length are the same in both drawings.So they are proportional. Making the head too long or short would look bad! NOW, how do we use this? So you should draw the head 21 long. We can use proportions to solve questions involving percents. Example: what is 25% of 160 ? Example: what is 25% of 160 (continued) ? Answer: 25% of 160 is 40. Example: what is $12 as a percent of $80 ? Example: The sale price of a phone was $150, which was only 80% of normal price. What was the normal price? We can use proportions to solve similar triangles. 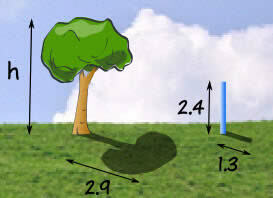 Example: How tall is the Tree? Sam tried using a ladder, tape measure, ropes and various other things, but still couldn’t work out how tall the tree was. But then Sam has a clever idea … similar triangles! Answer: the tree is 5.4 m tall. And he didn’t even need a ladder! It is the same calculation as before. Ratios can have more than two numbers! 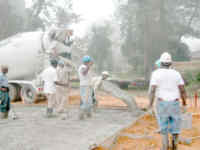 For example concrete is made by mixing cement, sand, stones and water. A typical mix of cement, sand and stones is written as a ratio, such as 1:2:6. We can multiply all values by the same amount and still have the same ratio. So when we use 10 buckets of cement, we should use 20 of sand and 60 of stones. Example: you have just put 12 buckets of stones into a mixer, how much cement and how much sand should you add to make a 1:2:6 mix? You have 12 buckets of stones but the ratio says 6. That is OK, you simply have twice as many stones as the number in the ratio … so you need twice as much of everything to keep the ratio. So it should be just right! That is the good thing about ratios. You can make the amounts bigger or smaller and so long as the relative sizes are the same then the ratio is the same. 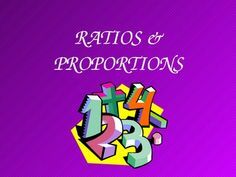 To learn more about Ratios and Proportions join our Online Live Math Coaching Classes. 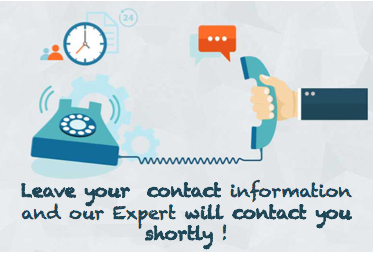 Schedule Your 75 min Free Assessment Today with our Experts !